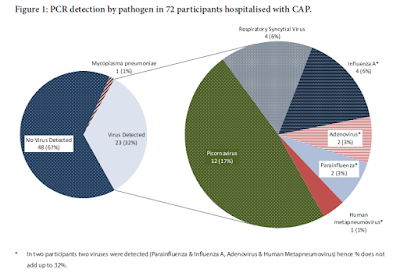 Saudi Arabia's spring surge in MERS cases continues, with three more cases linked to the ongoing nosocomial outbreak in Buraidah, and two new primary cases both linked to camel contact. First from Buraidah - where we've already seen 14 cases an 4 deaths announced this month - we learn of two more hospitalized patients, and another HCW infected, along with two deaths (one new case, one previously announced). 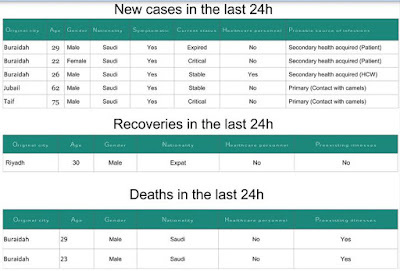 This brings the Buraidah cluster - since the first report on March 3rd - to 17 cases and six fatalities. 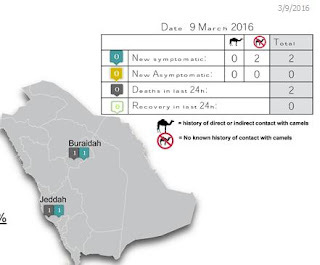 Elsewhere, both Taif and Jubail report new primary (community acquired) cases with recent camel contact.